Enter the name of the connection here. You can enter a description for the connection here. With this method (HTTP Basic), the login information will be requested. The user entered here will only be needed to access the service metadata in the Portal Manager. This method is useful for services provided via the Intrexx OData provider. Login information will be transferred encrypted here. To access the metadata, enter an Intrexx user and corresponding password here as well. The users from your Active Directory must have been . imported into your portal. 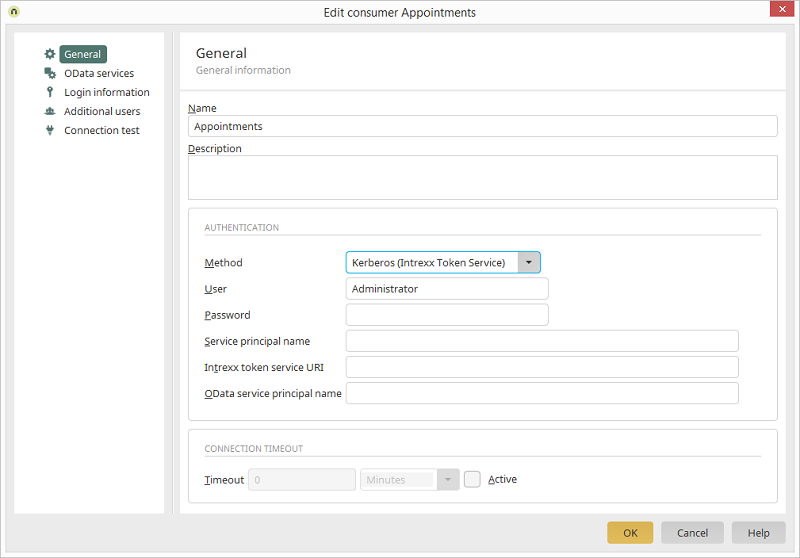 Please make sure that at least one user is included in the Administrators group, so that the system may continue to be managed. The server on which Intrexx is installed requires the group policy "Delegation". All clients and servers must be members of the same domain. In Internet Explorer, the security settings for the used zone must have the user authentication setting of "Automatic logon with current user name and password". Additionally, the option for "Enable Integrated Windows authentication" must be selected in the advanced settings. With this method, a certificate store in PKCS12 format can be uploaded. Later, each user can upload their own certificate store using a login form. 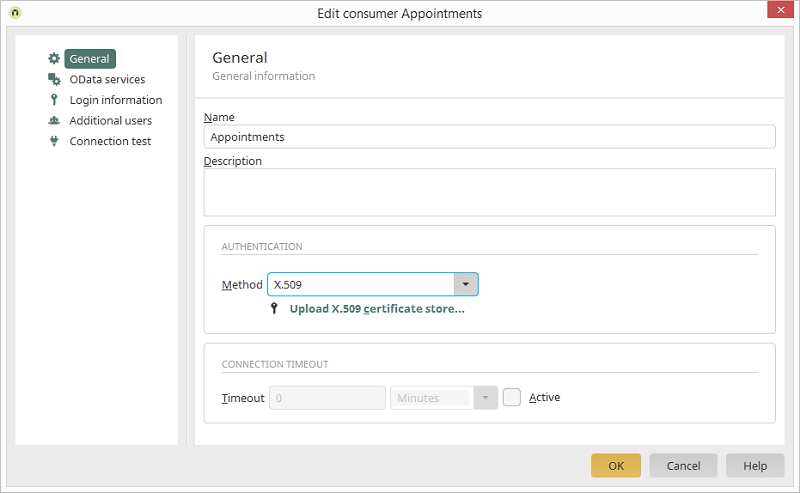 For authentication with X.509 certification, the root certificate of the authentication authority, which is responsible for issuing the client certificates, must previously have been imported into Intrexx. Restart the portal service afterwards. In the following, excerpts of some example configurations for commonly used OAuth2 services are listed. Many of these services cannot be used as OData services. 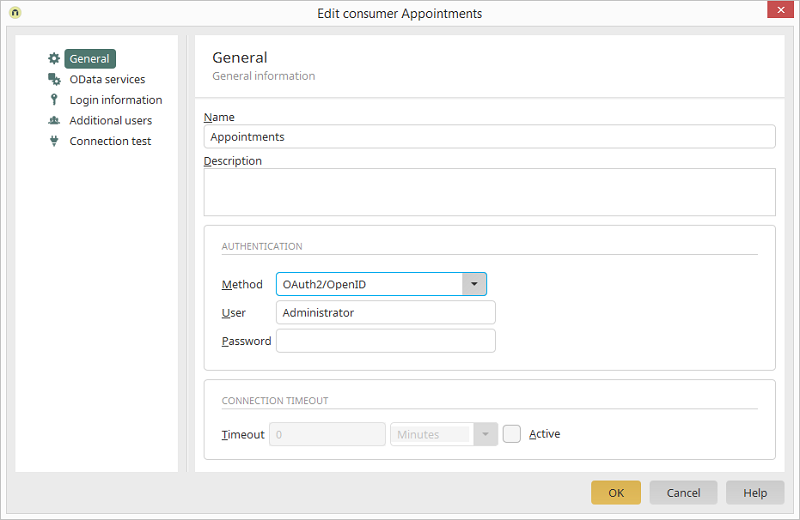 Despite this, the OAuth2 authentication can be used for direct HTTP accesses to the service in Groovy scripts. 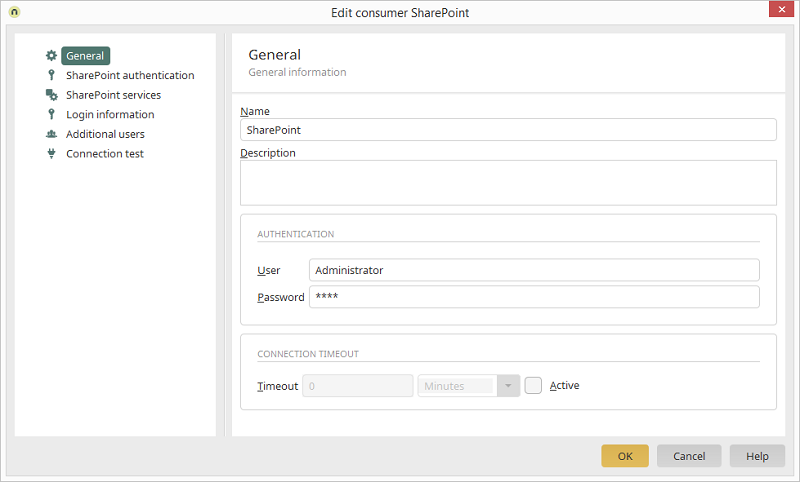 Click here for more information about forms-based authentication for Microsoft SharePoint connections. Click here for more information about forms-based authentication with identity providers conforming to SAML for Microsoft SharePoint connections. Enter how long the connection should be maintained in milliseconds, seconds, minutes or hours. With this setting, the defined timeout will take effect. Enter the name of the new connection here. You can enter a short description here. Enter the username and password for the user you want to use to access SharePoint. The user entered here will only be needed to access the service metadata in the Portal Manager. The method "OAuth2" supports services that require an OAuth2 authorization for users. Should the service support an auto approval of the user, the login of a user can be specified here for the metadata. If this is not possible, the metadata document must first of all be saved as a local file and stored in portal directory internal/cfg/odata with the file name: <SERVICE_GUID>.edmx.